Grocery shop and greengrocer on London Road. See the Past and Present of Croydon's London Road for history up to late 2014, at which point number 59 was the Croydon Food Centre photo. 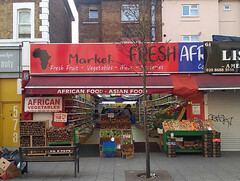 The Croydon Food Centre continued to trade at the premises until at least March 2017, but some time between then and June 2018 numbers 59 and 61 were amalgamated into Fresh Africa, stocking groceries in number 59 and fresh fish in number 61 photo. By August 2018 the fish had gone, number 61 was advertised to let photo, and Fresh Africa was at number 59 only. Last edited 2018-12-25 16:51:49 (version 44; diff). List all versions. Page last edited 2018-12-25 16:51:49 (version 44).